WE manufacture a complete line of equipment for the fabrication of panel radiators for transformer. 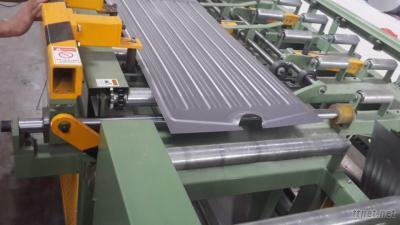 - This production line is able to produce panel radiators of various dimensions. - The whole production process is fully automatic. Roll Form Press, Panel coupling, Spot Weld, Seam Weld for 4 sides of a panel, Edge shear, Panel ranking, Head punch, etc. The Combination Roll Former and Press Die enables production of radiator panels of any length. Swapping of the dieset enables quick and easy change-over for production of various panel widths. After two panels are formed, they will be automaticlly matched and coupled. Then they will be delivered to spot welder for next working process. The automatic spot welder accepts the standard 230, 375, or 520mm wide panels or according to specification. The spot welder is a self contained unit that has 6 seperate spots for welding, and welds each spot 72mm apart in each of the 2, 4, or 6 grooves in each cycle. The start output for welding is given by the computer controller. The 200 KVA seam welder is set up for manual control. A platform is provided to facilitate the welding operatioin. This machine welds a continuous 5mm seam around both sides of panel. The knirling profile of the welding wheels enhances the penetration of the weld. Weld current and wheel pressure are adjustable. There are two sets of shear devices to cut and smooth fours sides of radiators. After a panel raditor is welded, it will be automaticlly racked one by one with a fixed distance, which makes the assembly much easier. The header pipe punching press with automatic indexing creats up to 40 pairs of slots on each pipe(for a maximum 40 panels). The header pipe is pierced with 2 rectangular type slots at the same time for each panel. The pipe is then automatically indexed for the next panel and the pipe punched again. The indexing is variable via computer indexing control, which enables the panel spacing to be easily changed if required.